Here is the full press release from Toshiba. Again, you can expect to be able to get the new Chromebook 2 in October. when web browsing, watching movies, listening to music and getting work done, even in low light environments. 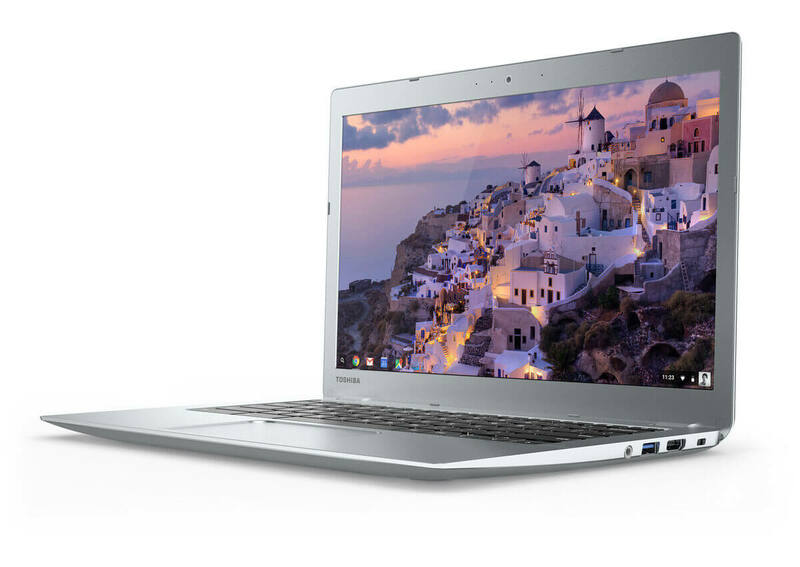 The Toshiba Chromebook 2 features a brilliant 13.3-inch diagonal Full HD (1920 x 1080) display[ii] with IPS technology that delivers sharpened color reproduction and accuracy, plus wider, more accurate viewing capabilities. Engineered to fit a 13.3-inch display in a 12-inch body and lightweight at just 2.9 pounds, the new Chromebook 2 comes packed with features without sacrificing portability or design. In addition, the device delivers a superior entertainment experience with strategically placed front-facing stereo speakers tuned to bring quality and attitude by the audio experts at Skullcandy®, a leading audio headphone provider and lifestyle brand. On-board dual array microphones and an HD webcam are also included to enable rich video chats. With an 8.5-hour battery life rating[iii] on both models, customers will be able to do more multitasking throughout the day, whether they are in the classroom, at the office or at home. These devices also come equipped with ultra-fast 802.11ac Wi-Fi® and a range of ports, including one USB 3.0 port, one USB 2.0 port, HDMI® output, SD Card slot and a security lock slot. Plus, customers can enjoy 100GB of Google Drive™ Storage[iv], 90-days of free unlimited music streaming on Google Play™, 12 in-air passes for Gogo® Internet and more – all included with the device. The new Toshiba Chromebook 2 will be available for purchase starting in October 2015 at major retailers, e-tailers and on toshiba.com/us, for $329.99 MSRP[v] for Intel Celeron model and $429.99 MSRP for the Intel Core i3 model.